Hotel Villa Bianca offers its guests a warm atmosphere and a choice of beautiful rooms where each detail has been taken care of; some of the rooms overlook the sea and others have a view on the pool. All the rooms are very well lit and very comfortable and are 17 to 23 square meters wide. All the rooms in Villa Bianca have a warm parquet pavement but each has a different type of furniture and color: in fact, you may choose from the pink, to the sky-blue, green, beige and wengé. Apart from all the accessories one can find in each room, our guests can ask for a bathrobe and a couple of bath slippers. 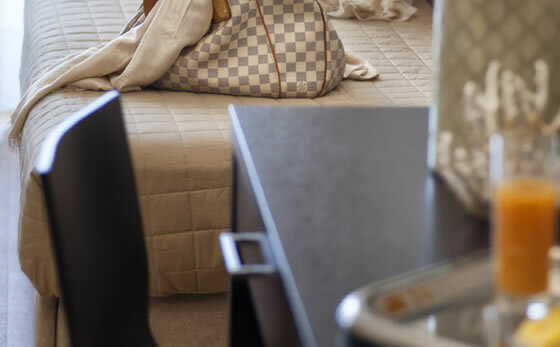 The Wi-Fi connection is free in all the rooms and all the hotel’s common places. 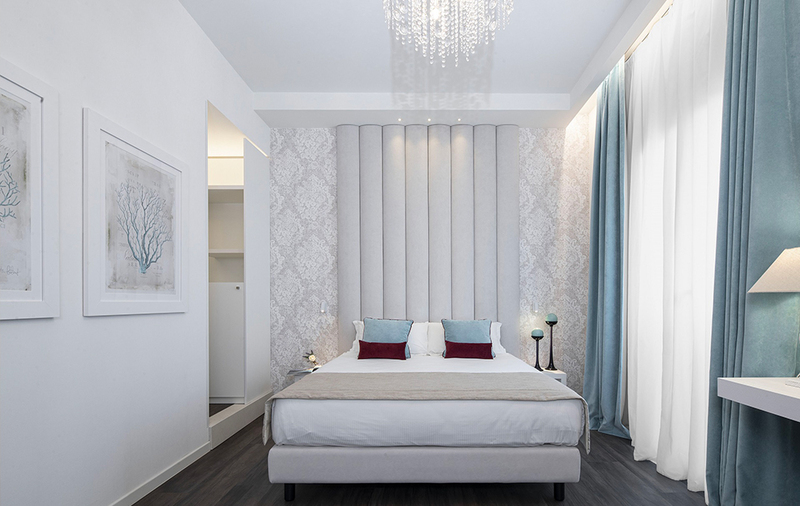 The Stilo rooms are stylish, bright and elegant. The elegance of the rooms is rooted in a modern and soft décor, characterised by relaxing colonial colours and refined details, such as decorative stuccoes that embellish the walls, wooden bedside tables with floral inlays and arresting white pickled-stained wooden frames carved by hand. Elegant, bright, refined. The Stilo Suites offer a taste of simplicity and elegance thanks to the colonial colours of the fabrics and furnishings, combined with sophisticated and refined design elements. Venetian-style details, from the mirror frames to crystal lamps and lights and bedside tables in white carved wood, enrich the suites with precious décor elements. The name of the Stilo suite originates from the word “style”, which evokes the sophistication of an atmosphere full of charm. The Classic room is the ideal room for those who choose a convenient price without giving up comfort. With a beautiful view on the hotel’s pool, the Classic room was designed for couples but it can also host three adults or a couple with a kid. Some of these rooms are accessible to persons with handicap. 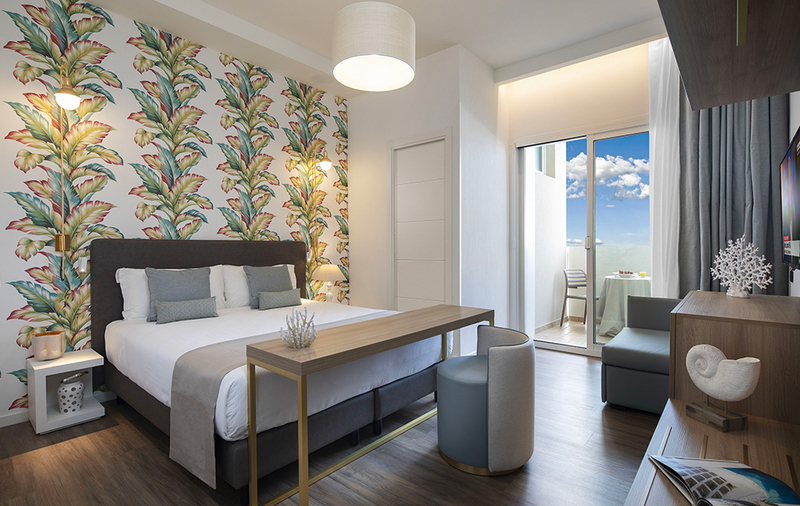 The Superior rooms offer comfort; this is why they are double-rooms and triple ones and they offer all the comfort of the hotel with a lateral view on the sea. The Superior rooms are double-rooms, wide with a marvelous view on the sea and a French style balcony. The Superior guests will find, every morning, their favorite newspaper. Our Deluxe rooms which are 20 to 23 square meters – are ideal for families. They all have a front view on the sea with a private balcony. Even the Deluxe guests will find their favorite newspaper every morning in their room.